CSIL Market Research The upholstered furniture market in India provides an overview of the upholstery market in India through updated statistics and offers a picture of the furniture sector, production and consumption trends, import and export figures, price and marketing policies, distribution channels structure and competitive system analysis. A detailed executive summary introduces the research report, providing details for the Indian upholstered furniture industry and basic data for the years 2010-2015. Part II describes the country's socio-economic context: macro-economic indicators, demography, urbanization process, consumer and construction markets. 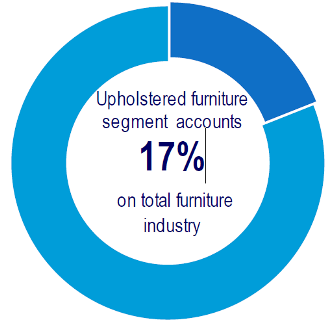 Features of the Indian upholstered furniture industry, with main statistics (production, consumption, imports and exports), world comparisons, product trends, price ranges and market pyramid, are illustrated in Part III. The Indian upholstered furniture distribution system is analysed through the description of the furniture demand structure in the country, the market potentials, channels and retailers and country policies for foreign operators. The competitive system analysis includes both local manufacturers and foreign players. With its 1.3 billion people and an increasing household and institutional spending power, India is currently one of the big emerging market economies in the world. This positive economic context has also fueled the growth of the whole Indian furniture market in the last years.